A strange man was one day found loitering in the courtyard of the castle, and the retainers, noticing that his speech had a foreign accent, suspected him of being a spy. So the fellow was brought before Sir Hugh, who could make nothing of him. He ordered the varlet to be removed and examined, in order to discover whether any secret letters were concealed about him. To-day we know that Abracadabra was the supreme deity of the Assyrians, and this curious arrangement of the letters of the word was commonly worn in Europe as an amulet or charm against diseases. But Sir Hugh had never heard of it, and, regarding the document rather seriously, he sent for a learned priest. “Then give the varlet food and raiment and set him on his way,” said Sir Hugh. Place your pencil on the A at the top and count in how many different ways you can trace out the word downwards, always passing from a letter to an adjoining one. The puzzle was to place your pencil on the A at the top of the amulet and count in how many different ways you could trace out the word “Abracadabra” downwards, always passing from a letter to an adjoining one. “Now, mark ye, fine fellows,” said Sir Hugh to some who had besought him to explain, “that at the very first start there be two ways open: whichever B ye select, there will be two several ways of proceeding (twice times two are four); whichever R ye select, there be two ways of going on (twice times four are eight); and so on until the end. 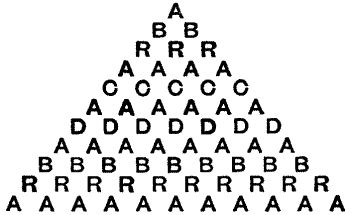 Each letter in order from A downwards may so be reached in 2, 4, 8, 16, 32, etc., ways. The dominions of a certain Eastern monarch formed a perfectly square tract of country. It happened that the king one day discovered that his four sons were not only plotting against each other, but were in secret rebellion against himself. After consulting with his advisers he decided not to exile the princes, but to confine them to the four corners of the country, where each should be given a triangular territory of equal area, beyond the boundaries of which they would pass at the costof their lives.Now, the royal surveyor found himself confronted by great natural difficulties, owing to the wild character of the country. 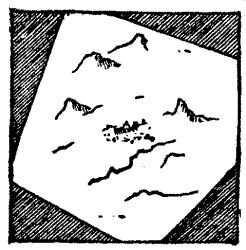 The result was that while each was given exactly the same area, the four triangular districts were all of different shapes, somewhat in the manner shown in the illustration. The puzzle is to give the three measurements for each of the four districts in the smallest possible numbers—all whole furlongs. In other words, it is required to find (in the smallest possible numbers) four rational right-angled triangles of equal area. Answer :When Montucla, in his edition of Ozanam’s Recreations in Mathematics, declared that “No more than three right-angled triangles, equal to each other, can be found in whole numbers, but we may find as many as we choose in fractions,” he curiously overlooked the obvious fact that if you give all your sides a common denominator and then cancel that denominator you have the required answer in integers!Every reader should know that if we take any two numbers, m and n, then m2 + n2, m2 – n2, and 2mn will be the three sides of a rational right-angled triangle. Here m and n are called generating numbers. The following is a subtle formula by means of which we may always find a R.A.T. equal in area to any given R.A.T. 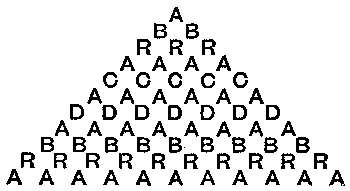 Let z = hypotenuse, b = base, h = height, a = area of the given triangle; then all we have to do is to form a R.A.T. from the generators z2 and 4a, and give each side the denominator 2z (b2 – h2), and we get the required answer in fractions. If we multiply all three sides of the original triangle by the denominator, we shall get at once a solution in whole numbers. The area in every case is 341,880 square furlongs. I must here refrain from showing fully how I get these figures. I will explain, however, that the first three triangles are obtained, in the manner shown, from the numbers 3 and 4, which give the generators 37, 7; 37, 33; 37, 40. These three pairs of numbers solve the indeterminate equation, a3b – b3a = 341,880. If we can find another pair of values, the thing is done. These values are 56, 55, which generators give the last triangle. The next best answer that I have found is derived from 5 and 6, which give the generators 91, 11; 91, 85; 91, 96. The fourth pair of values is 63, 42. The reader will understand from what I have written above that there is no limit to the number of rational-sided R.A.T.’s of equal area that may be found in whole numbers. 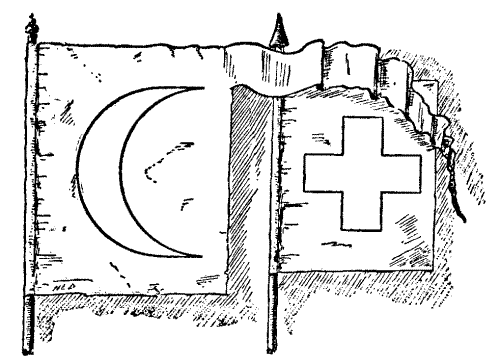 When Sir Hugh’s kinsman, Sir John de Collingham, came back from the Holy Land, he brought with him a flag bearing the sign of a crescent, as shown in the illustration. “I have thought much of late, friends and masters, of the conversion of the crescent to the cross, and this has led me to the finding of matters at which I marvel greatly, for that which I shall now make known is mystical and deep. Sir Hugh de Fortibus then explained that the crescent in one banner might be cut into pieces that would exactly form the perfect cross in the other. It is certainly rather curious; and I show how the conversion from crescent to cross may be made in ten pieces, using every part of the crescent. The flag was alike on both sides, so pieces may be turned over where required. Answer :”By the toes of St. Moden,” exclaimed Sir Hugh de Fortibus when this puzzle was brought up, “my poor wit hath never shaped a more cunning artifice or any more bewitching to look upon. It came to me as in a vision, and ofttimes have I marvelled at the thing, seeing its exceeding difficulty. The worthy knight then pointed out that the crescent was of a particular and somewhat irregular form—the two distances a to b andc to d being straight lines, and the arcs ac and bd being precisely similar. He showed that if the cuts be made as in Figure 1, the four pieces will fit together and form a perfect square, as shown in Figure 2, if we there only regard the three curved lines. By now making the straight cuts also shown in Figure 2, we get the ten pieces that fit together, as in Figure 3, and form a perfectly symmetrical Greek cross. 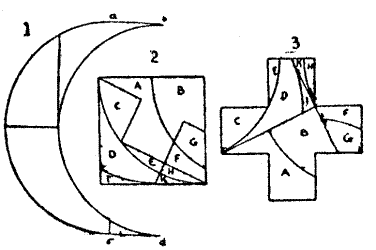 The proportions of the crescent and cross in the original illustration were correct, and the solution can be demonstrated to be absolutely exact and not merely approximate.